Felons may think no one will hire them after serving their sentence, but there are resources available. Many times it takes learning a new trade or starting a different career. For those with experience in electrical work, becoming an electrician is a possibility. 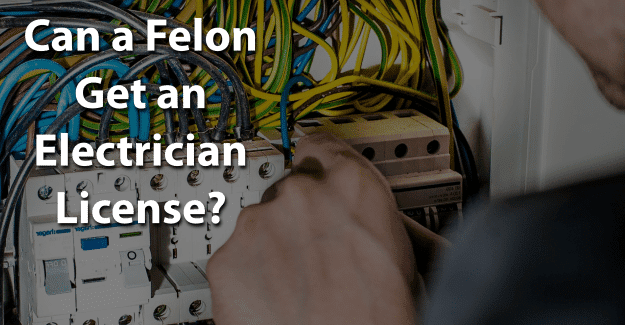 This blog post will address the issue of whether or not a felon can get an electrician license. What is Required to Get an Electrician License? An electrician installs, maintains, and repairs electrical lines like lighting, communications systems, and control systems. An electrician reads blueprints and diagrams to install and repair wiring, circuit breakers, and transformers. A license is issued by a state agency to practice a profession and is required in order to call oneself a licensed professional. Some states have a single license and some have a level system. Licenses, as well as requirements, vary from state to state, and from profession to profession. Licensing can be viewed as mandatory certification. Under a licensure system, states define the practice of a profession and stipulate that these tasks may be legally performed only by those who are licensed. A certification is typically a voluntary process, although certification can be mandatory or required to practice in certain states. Certification is often provided by a private organization for the purpose of providing the public protection on those individuals who have successfully met all requirements for the credential and demonstrated their ability to perform their profession competently. There are a number of steps involved in getting an electrician license, although licensing requirements are different depending on the state. First is the educational requirement: a candidate must graduate from high school or have a GED. Next is to take electrician courses at a vocational school or community college to learn the basics. Someone interested can then join an electrician apprentice program which is sponsored by the International Brotherhood of Electrical Workers (IBEW), the National Electrical Contractors Association (NECA), or Independent Electrical Contractors (IEC). An apprenticeship lasts four or five years. During that time, an apprentice is paid while learning the basics as an electrician working under a licensed electrician. When an apprentice has met all requirements of the program (typically 8,000 hours of paid supervised work experience), he or she takes an exam to become licensed as a journeyman electrician. This means being able to work on electrical designs, installation, and repair. To get a master electrician license, a journeyman electrician must complete 12,000 hours of supervised experience working under a currently licensed master electrician after at least two years as a journeyman electrician. A candidate must also pass an exam to complete a master electrician license. The U.S. Bureau of Labor Statistics indicates that there are approximately 628,000 licensed electricians which includes journeymen and master electricians. The median salary for an electrician in 2015 was $53,000. Experience and skill level could have a significant impact on these earnings. It also depends on the area of the country where an electrician works. Those on the West coast and in the Northeast have the highest annual salaries. This occupation is expected to show a 14% growth by 2020. While the exact requirements for felons to get an electrician license differ somewhat depending on the state, the regulations typically indicate that felons with certain convictions are generally not eligible to work as an electrician. In order to be successful in their pursuit of getting an electrician license, it is essential for felons to be honest about their background. They are already working with the often negative perceptions of being dishonest, untrustworthy, and unwilling or unable to follow directions from authority figures. There are re-entry programs, such as drug treatment, and educational opportunities for felons who need them. For many felons, having their felony expunged can give them the chance they need to begin with a clean record and succeed in getting an electrician license. It is a significant challenge, but it might be worth it for a felon that wants to get an electrician license. Having his or her record expunged and also documenting any training programs or additional education could make the essential difference in a felon succeeding in getting an electrician license. What do you think about this blog post? Have you or someone you know been in the situation of trying to get an electrician license with a felony? What was that like for him or her, and how did he or she achieve success? Please tell us in the comments below.